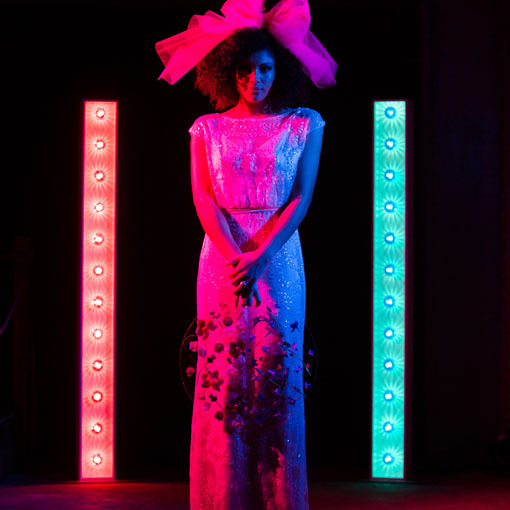 We have a range of extras including light up accessories and features to spark your creativity! Our own mini industrial revolution! The Rustic Hearts. 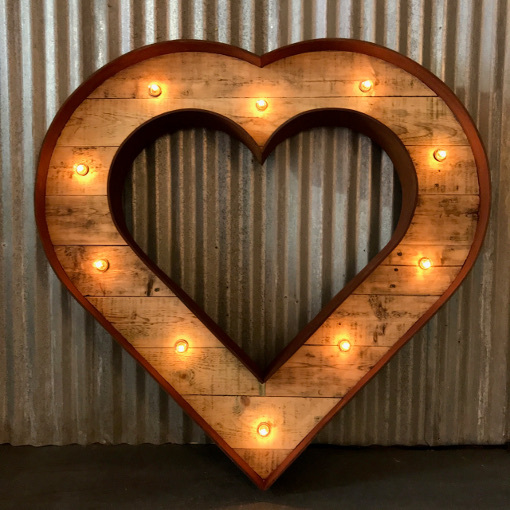 Edged in mild steel with raised bolts and fitted with 10 sparkle bulbs our RUSTic hearts have a real industrial feel and add some of that vintage fairground glamour to the proceedings. Available on their own or in a pair they are perfect for lighting up dark corners or adding some pretty light to a card or cake table. 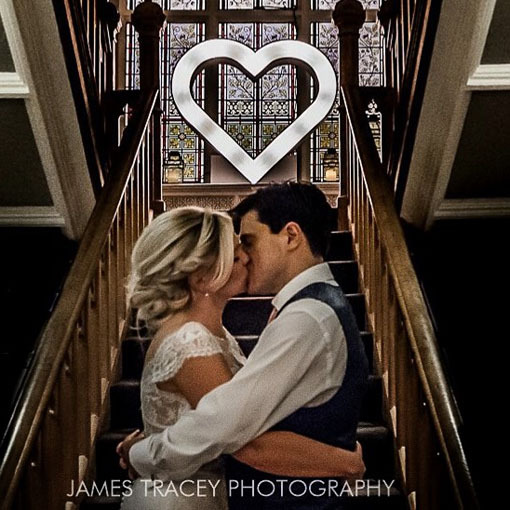 The same unique style as the classic but with added love. 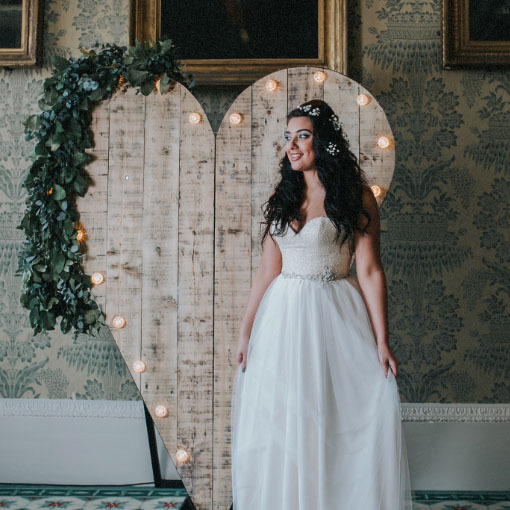 Our large 4ft hearts look stunning located at the end of an isle during the ceremony or placed instead of an ampersand (&) inbetween your initials. Painted in the same Matt White as our classic letters the kissing hearts add something extra to an entrance! To Match our Rustic Love Letter collection Our Rusty Heart has had a clever upgrade! This 4ft Wooden Heart has been sanded down by my very self and had a very clever paint job to create a rust effect. 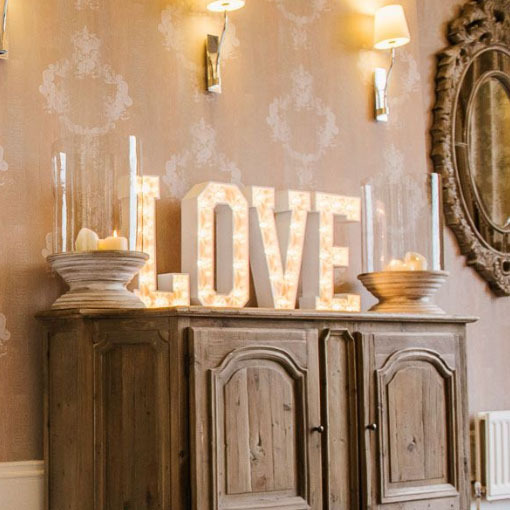 Matches perfectly with our Rustic Love letters, made from reclaimed wood the Rusty Kissing heart looks incredible in an entrance, at the top of the aisle or next to the LOVE Letters. 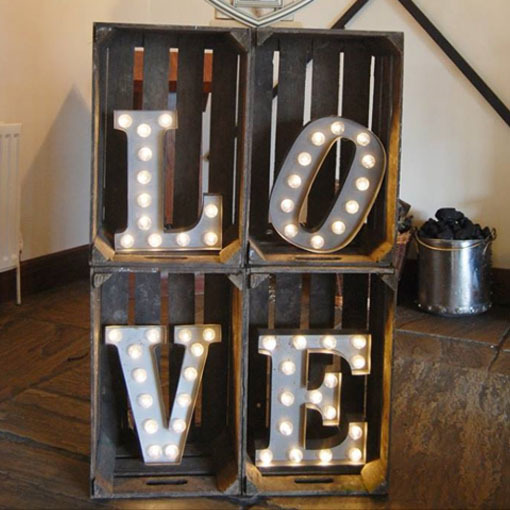 Lit with the same classic golf ball bulbs as the light up Wooden Love Letters they couldn’t be better suited! 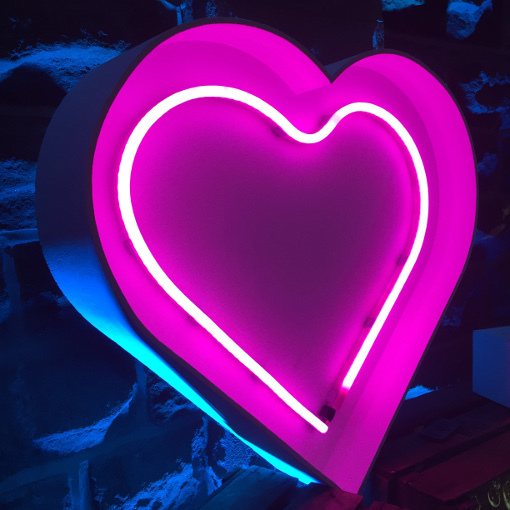 We heart Neon which is why we love our Neon heart! 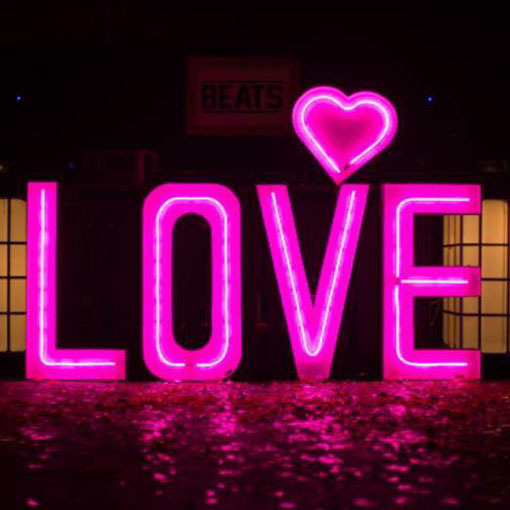 Best hired in conjunction with our NEON LOVE Letters this simple white heart with pink neon is the perfect accessory for creating some romantic 80’s glamour. We just LOVE this Mr & Mrs effect! 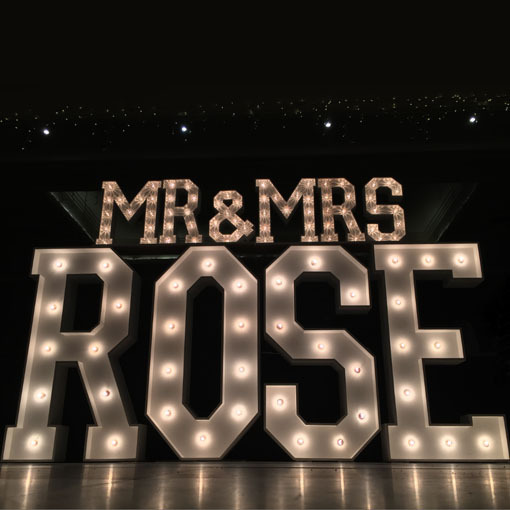 What better way to announce your marriage to your guests than by them seeing your new surname in lights. 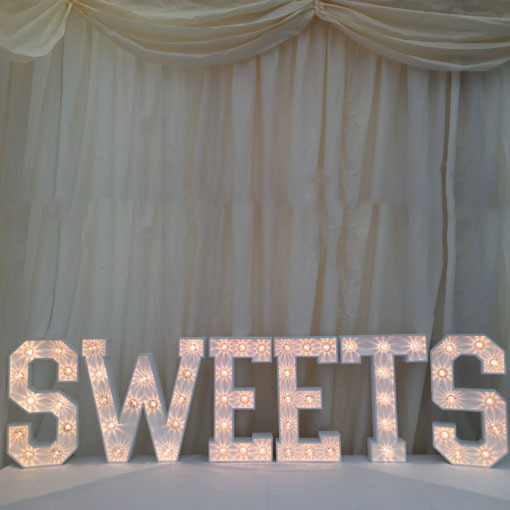 Our little MR&MRS were designed to sit perfectly upon top of our 4ft letters for a showstopper of a display. Also available to hire on their own too for the card table, top table or mantelpiece. Classic chalkboard with added TWIL magic! 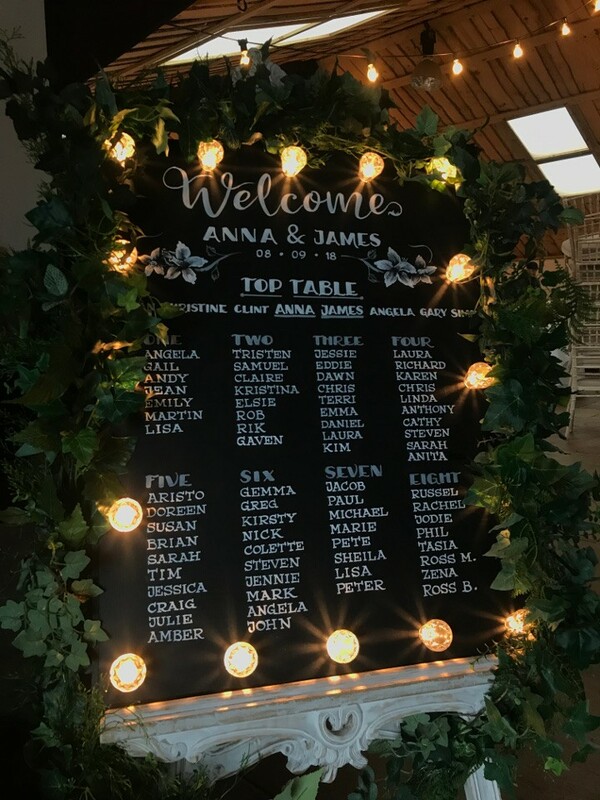 You can’t fail to have noticed the popularity of chalkboards at weddings over the last few years so we’ve taken it one step further and added some TWIL Magic and fitted ours with sparkle bulbs. 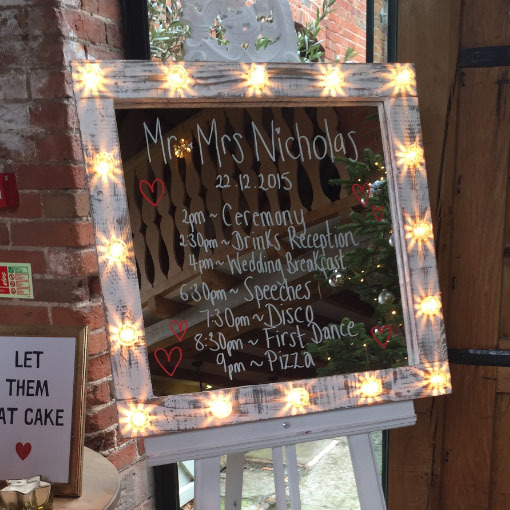 Use it to chalk a welcome message, food/drinks menu, table plan or just something fun and silly. Our blackboard message board sits on top of our easel with Portrait or Landscape. Why not Add our Rustic Faux-liage garland too! This brand new retro peg board, also known as a barber board is the perfect way add a unique look to your wedding. The best thing about this is WE do the hard work and complete whatever you would like written on it. Below are some ideas! This Peg board will sit on our easel. 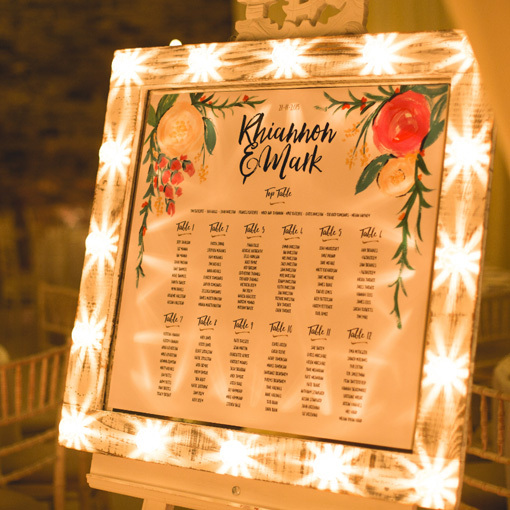 To match our Vintage Floral Love letters our impressive large Mirror and floral frame can be used for your table plan or message board. 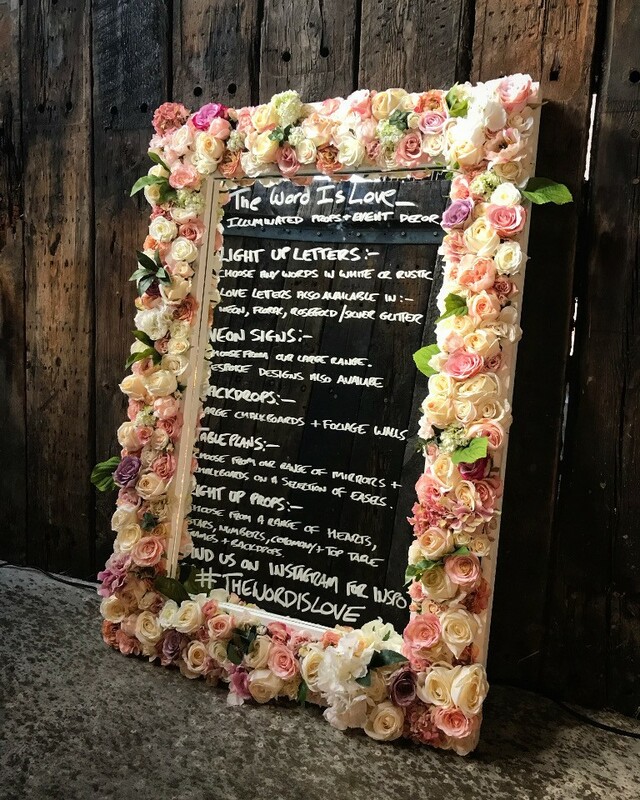 A beautiful mix of Roses, Hydregeas and Pretty Pastel Flowers the Wedding Mirror Message board is totally adaptable. It’s not the size, it’s how you use it! Our table top LOVE letters are great for popping in front of a top table, be placed on a card table or perhaps bring much needed life to a windowsill or mantelpiece. Made to our exacting standard font but just a little smaller. Our exclamation mark is worth shouting about! Make a statement! Our exclamation mark is sure to be heard loud and clear. 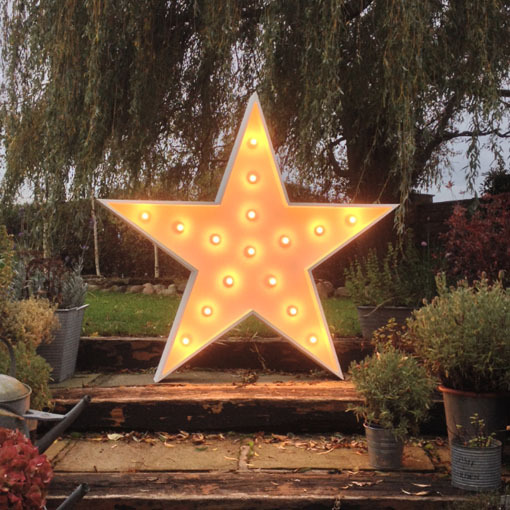 Available in our standard 4ft font with a choice of classic or sparkle bulbs. Got a questions to ask? 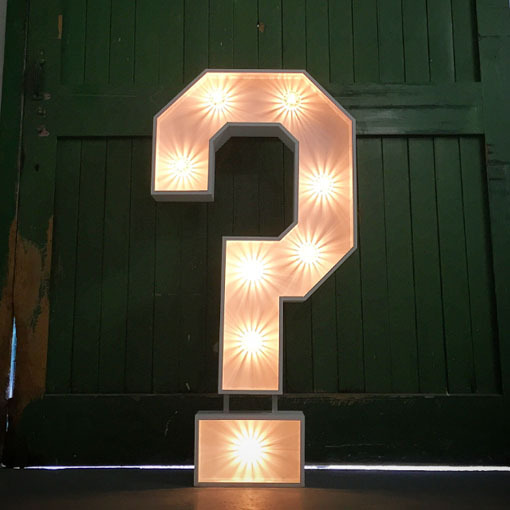 Our question mark in our classic 4ft font looks amazing. 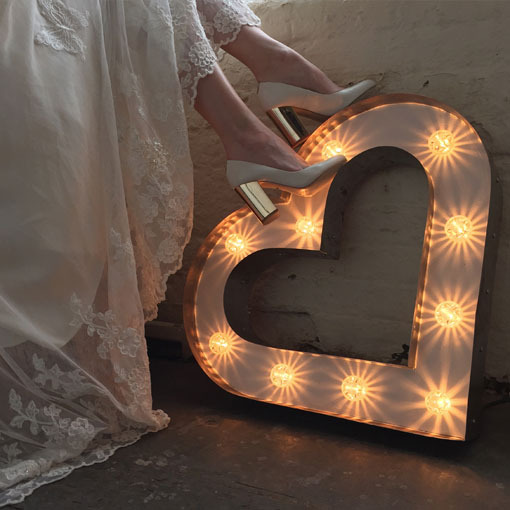 Perfect for popping the big question 😉 Available with a choice of classic or sparkle bulbs.. This custom made star in our classic 4ft font looks fantastic stand alone or when incorporated with our classic 4ft letters. Available with a choice of classic or sparkle bulbs.. 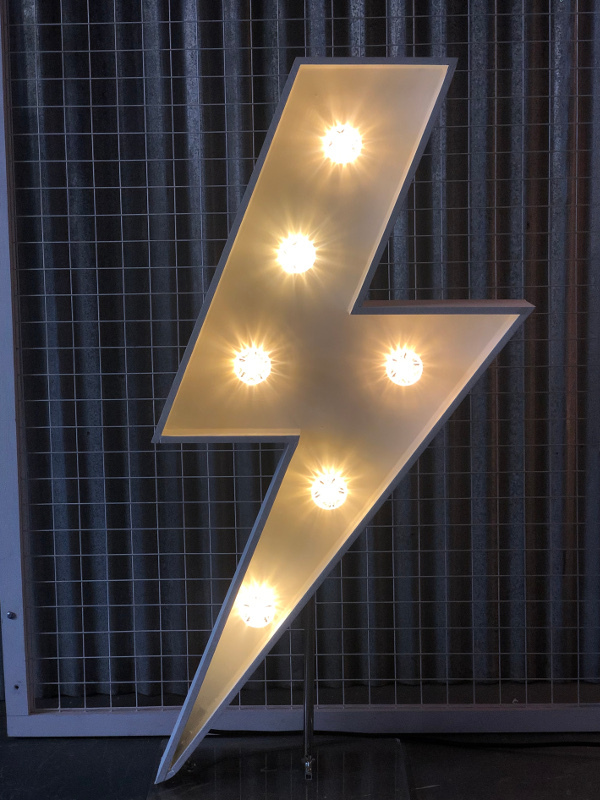 Custom made 4ft Lighting strike for hire, can be hired in between initials, (AC DC Style) or as an addition to backdrop or letter hire. We fell in love with these vintage apple crates! 4 original vintage Apple crates fitted with a choice of either our white table top LOVE letters or our slightly smaller metal LOVE letters. Stack them in a row, in a cube or one on top of another for the perfect vintage look. 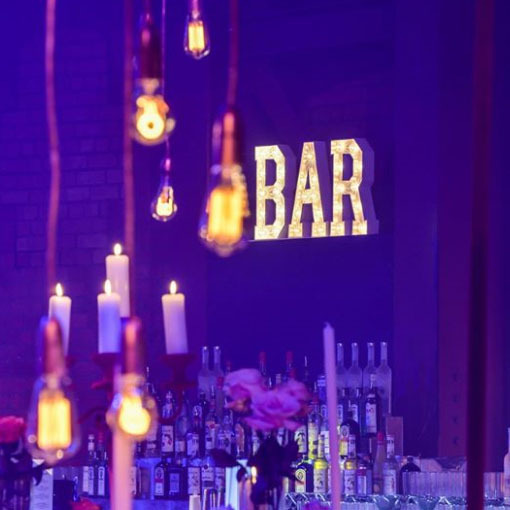 ‘Bar’ – Just in case people need pointing in the right direction. Made to our exacting specifications in our classic font. Mirror, Mirror on the wall.. Is TWIL the best of them all? Love is sweet. Well we think so! If you have a sweet table/bar or candy cart these are perfect for adding some light up glamour. Made to our exacting specifications in our classic font. 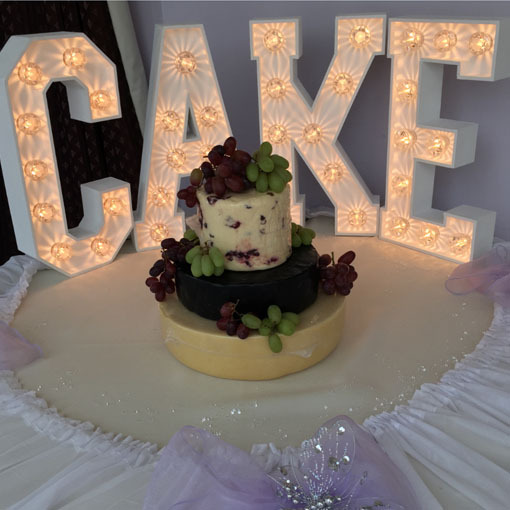 Give your cake the main feature it deserves! As amazing as a lot of wedding cakes are we feel the tables they are displayed on are often a little drab. 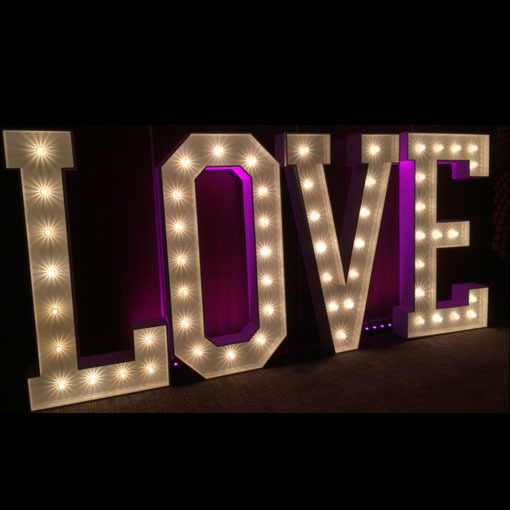 Hire our cake letters and add some TWIL Love to illuminate the display. Made to our exacting specifications in our classic font. We just can’t get enough of NEON! 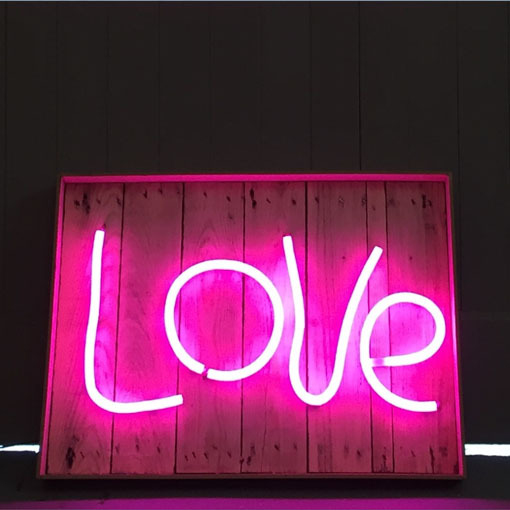 Using reclaimed timber and pink neon we came up with this small & clean looking LOVE sign that still manages to really make a statement. It’s young, fun, and no one else will have it! Works great with our Neon range. Light it up with our LED uplighters! The correct lighting can make or break the tone and ambiance of a whole room. 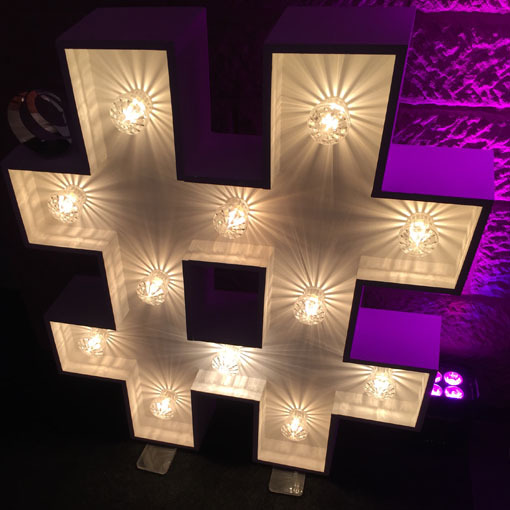 Placed behind our letters these LED uplighters with a choice of hundreds of colours and colour patterns can add a whole other dimension to the room. To see what’s possible and for more information visit our venue lighting page. One of our newest and favourite accessories! Using only the best imitation foliage there is, we have created the ultimate faux foliage garland. 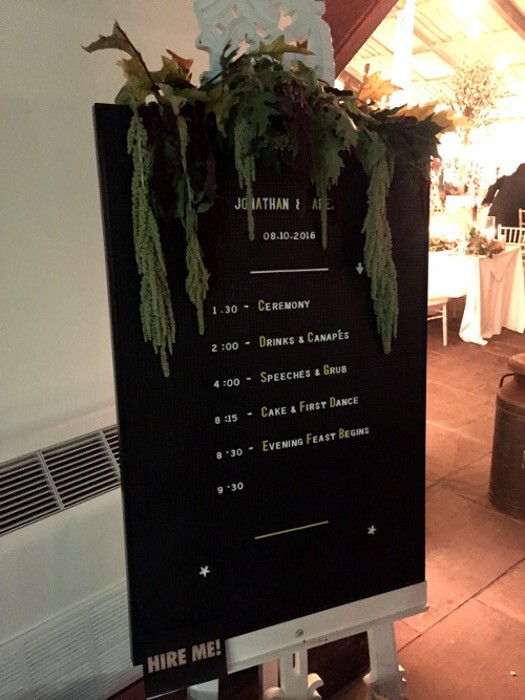 An impressive 11 foot long, green wedding garland can accessorise any of our props and backdrops or be used independently for a table runner, or draped over any of our letters. Don’t forget to check out our Pinterest boards for more wedding inspiration. Perfect for framing our LOVE Letters! 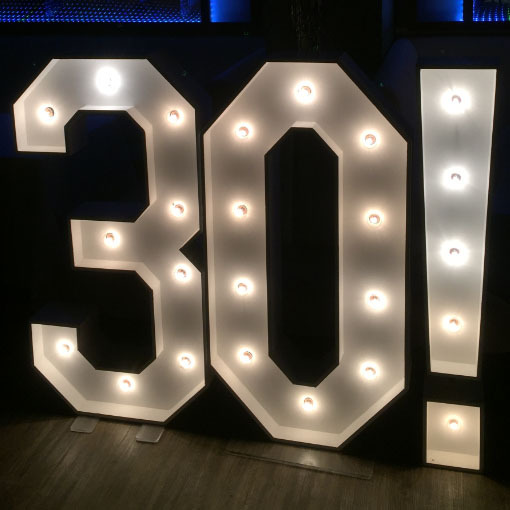 Standing at 6ft tall and fitted with 12 sparkle bulbs each, our light towers come as a pair and are perfect for framing our letters, lighting up dark corners of a dance floor / stage or forming an arch at the top of an aisle. Bulbs are available in a choice of colours.